Open spaces are no doubt modernistic and fun to have still there comes a time when you need some separate space for yourself. Instances are watching your favorite show in the living, working on laptop or studying your favorite book without any disturbance. Room dividers can be used best to alienate yourself from the surrounding. As you are on a DIY projects so we share you to build this DIY pallet room divider yourself and enjoy easy sectioning of your spaces. Having four panels this wooden room divider would be enough to separate a big portion into two and thus make you enjoy some private and undisturbed time. You need to build each panel with cut out pallet slat or plank pieces and then bring them together with metal hinges forming that lovely wavy design. Not only in house spaces this gorgeous and stylish room divider can be feasibly used in the office spaces, restaurants, clinics etc. Staining it in the rich brown stain is an intentional task to make it look a spruced up rustic piece with peak natural warmth and beauty. 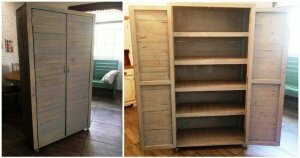 This room divider is simply made from the pallets and if you know even the basic crafting skills you can nicely make it of your own. This lovely room divider comes with four wooden panels so you would need pallets in abundance to make it at home. Pallets have been cut down precisely into the custom cut pallet slat pieces to build the each panel with horizontal stacking method. Using the hinges the four panels have been joined together and this rustic looking room divider has been given a unit form. The rich brown color of the stain has been coated all over the room divider and make it look really a rustic and natural piece of beauty for your home decor and style.